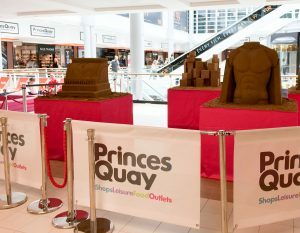 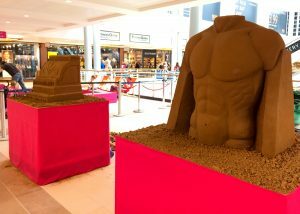 Sand sculptures to celebrate the opening of Princes Quay Outlet Shopping. 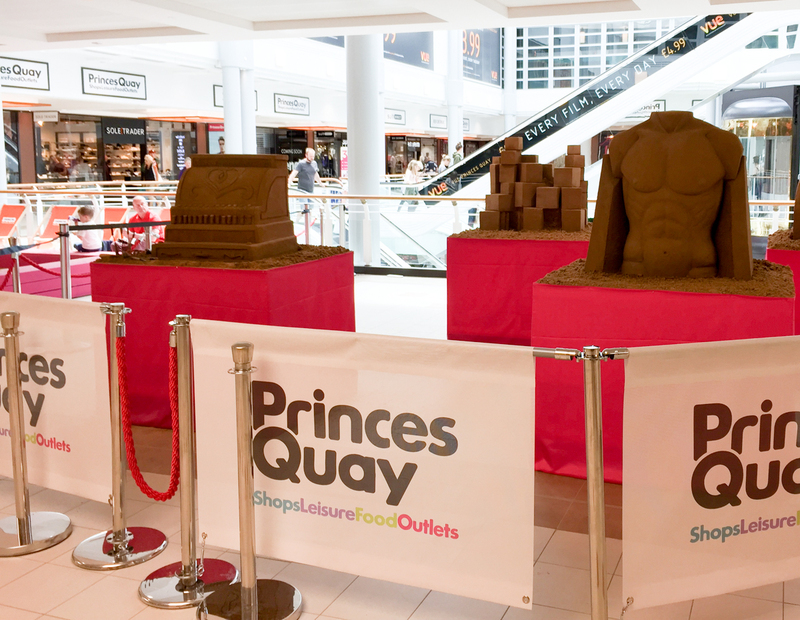 Hull is the place to be this year, as it is the City of Culture for 2017. 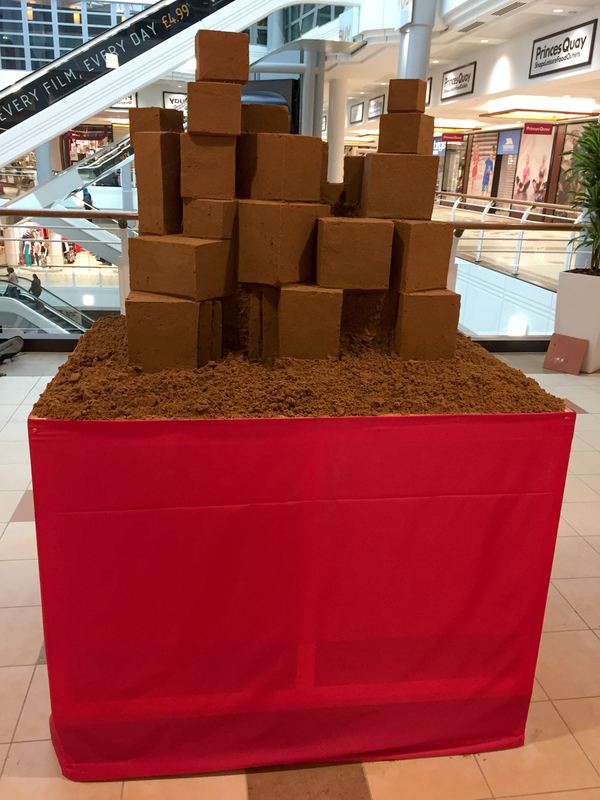 Lots of exciting new things happening in the city, so we were really glad to get the opportunity to visit. 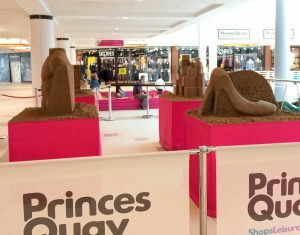 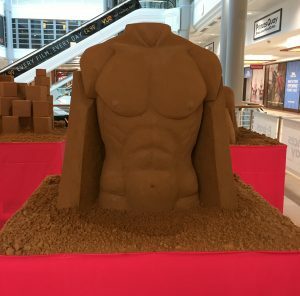 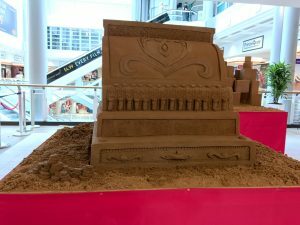 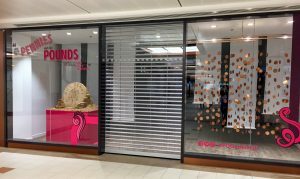 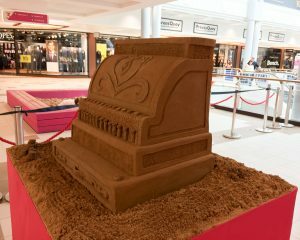 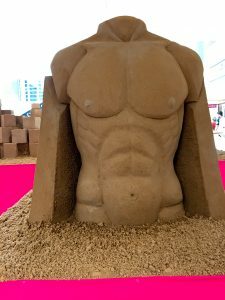 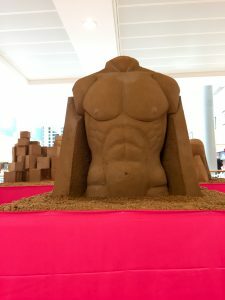 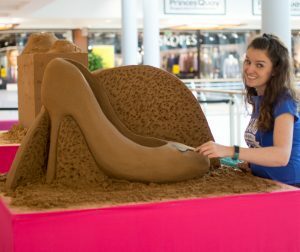 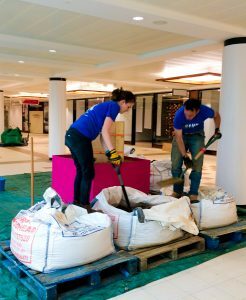 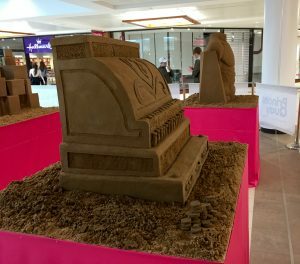 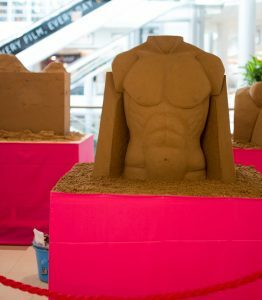 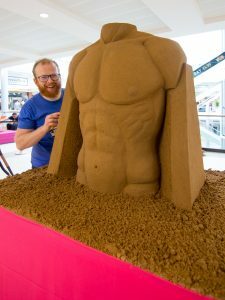 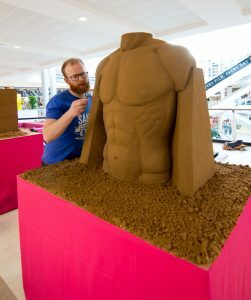 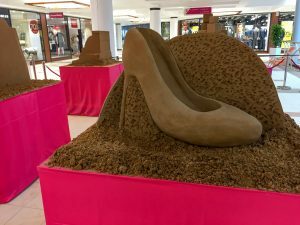 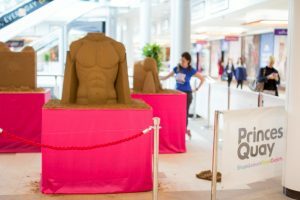 Princes Quay Shopping Centre in Hull were opening a new floor dedicated to outlet shopping, they invited us to be part of their opening events where we would make 6 sand sculptures for the public to enjoy. 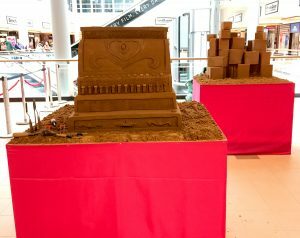 There was also an interactive sand area where the public could try their hand at sand sculpture too. 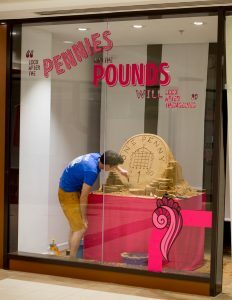 We set a couple of the sand sculptures up in shop windows so while we were carving, it would create a live window display. 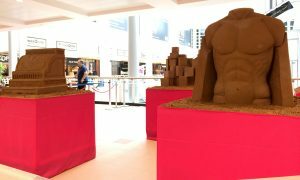 The rest of the sculptures would be made in the main shopping mall. 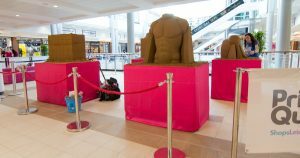 The shopping centre then asked if it was possible to move all the sculptures into shop windows after the event so they could keep them all summer. 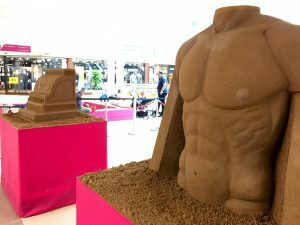 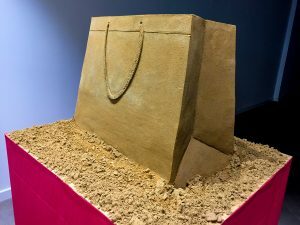 It is indeed possible to move certain sand sculptures after they have been made, so in a few weeks time once dried, the sculptures will then be displayed in various shop windows. 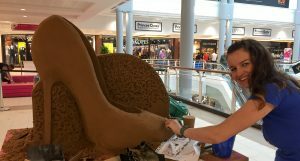 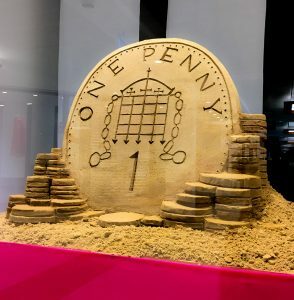 On day 1 Tom took himself off to a shop window to create a huge penny made from sand, while Jamie and Claire were in the mall, Claire made a shoe and Jamie a very impressive male torso! 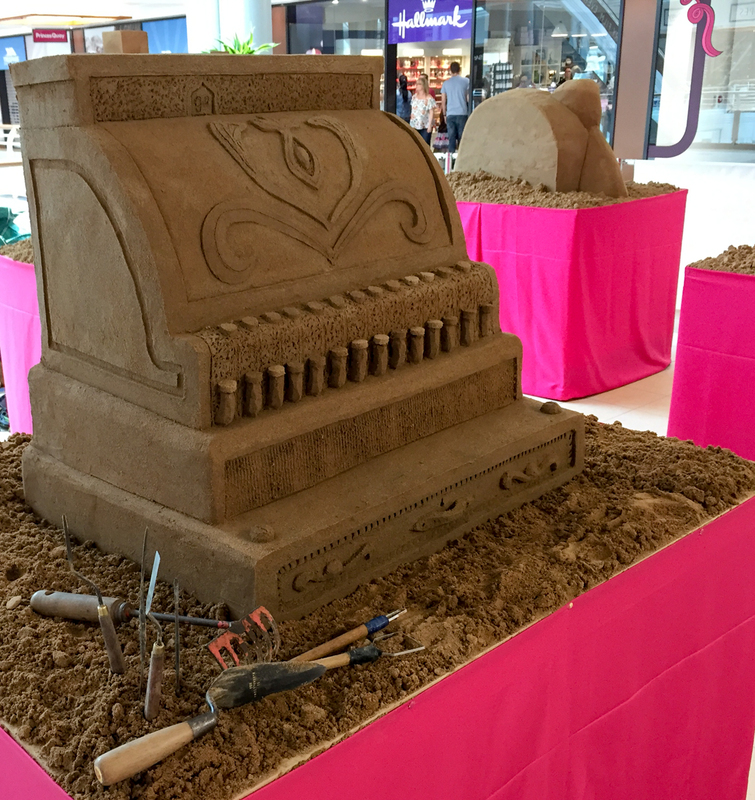 Unusual window display ideas, sand sculpting. Day 2 Claire headed to another shop window to create a sand sculpture of a gift bag and Tom created an abstract stack of gift boxes in the mall. 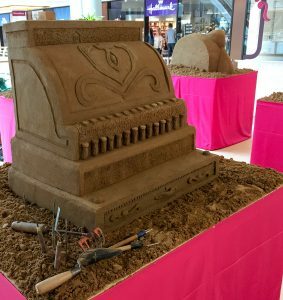 By day 3 and 4 Claire worked solo to create an old fashioned till. 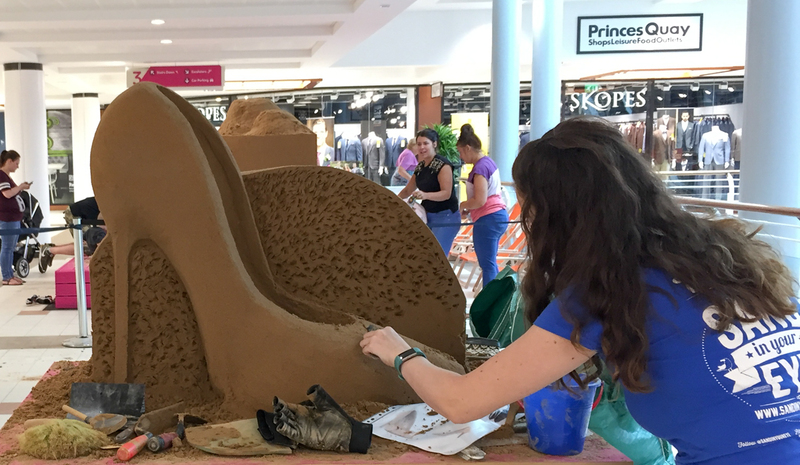 Having two days to create the sand sculpture meant she could spend lots of time on the details. 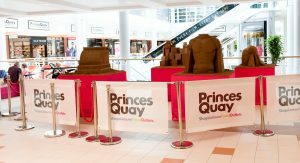 During the whole event Princes Quay had many other entertainers there too including musical performers, competitions and more. 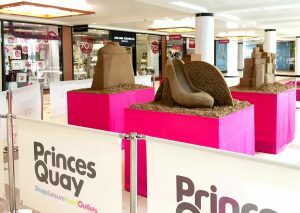 Pop along to Princes Quay in Hull and see the sand sculptures for yourself! 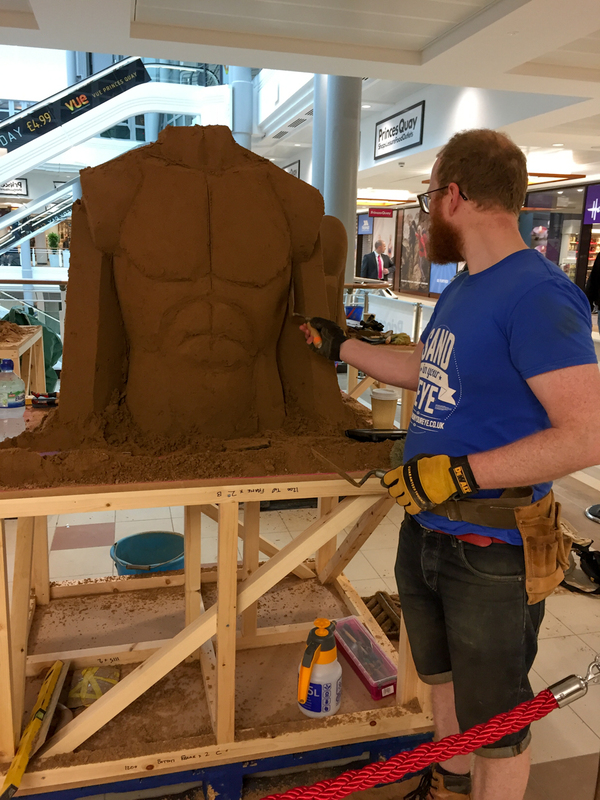 Jamie working on a sand sculpture in Hull. 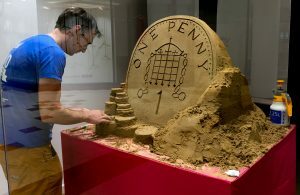 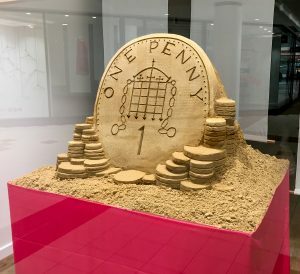 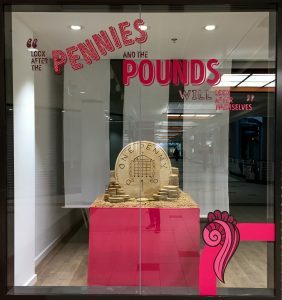 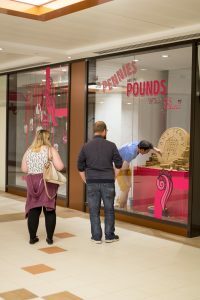 Penny sand sculpture on display in shopping centre window in Hull. 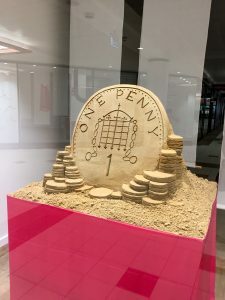 Window display, penny sand sculpture. 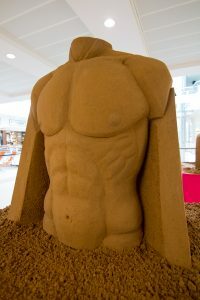 UK sand sculptor, Jamie Wardley sculpting in Hull. 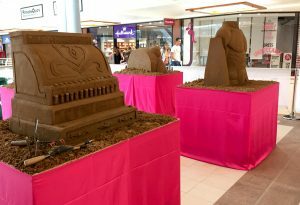 Sand In Your Eye, pop up sand sculpture events. 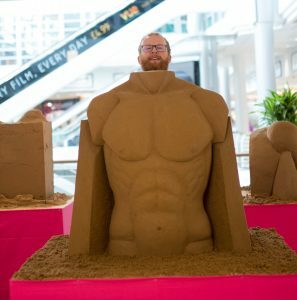 Pop up sand art events, summer fun. 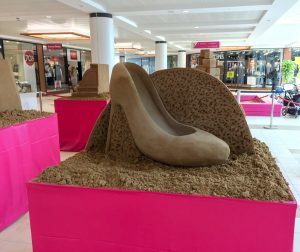 Sand play area next to the live sand sculpting in Hull. 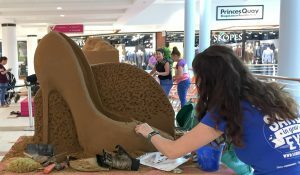 Sand sculptor Claire Jamieson works on the shoe sand sculpture in Hull. 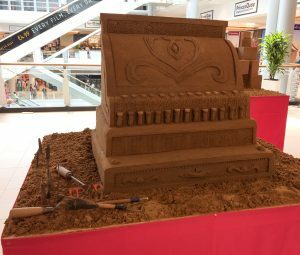 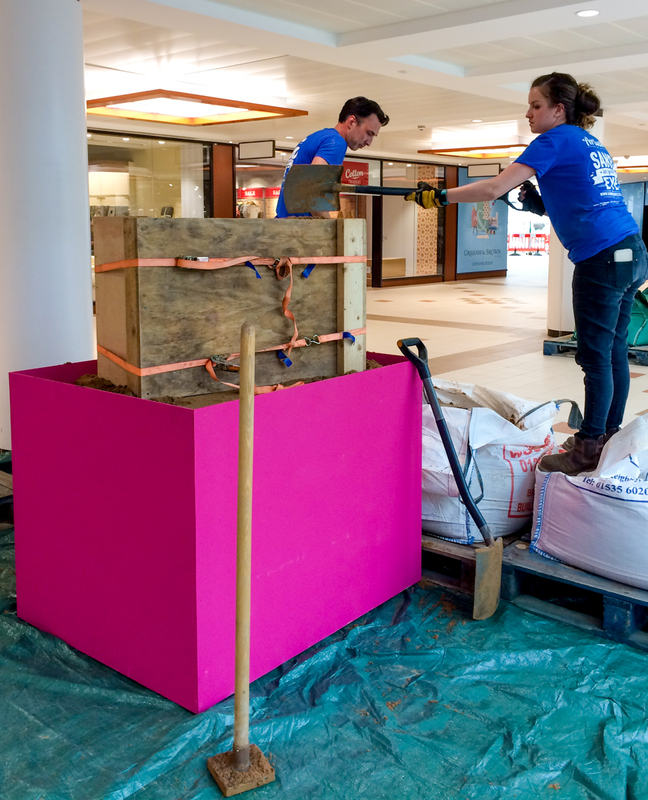 Indoor shopping centre events, table top sand sculptures. 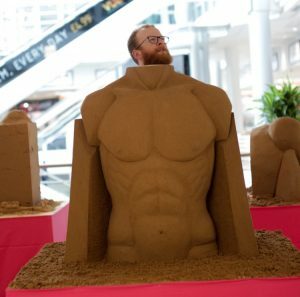 Yorkshire sand artist Jamie Wardley an his impressive torso! 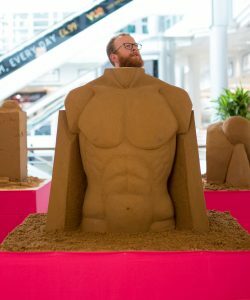 Interactive sand sculptures make great photo opportunities. 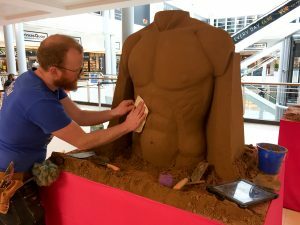 Sand sculpture, shopping centre entertainment. Moveable sand sculptures make great window displays.